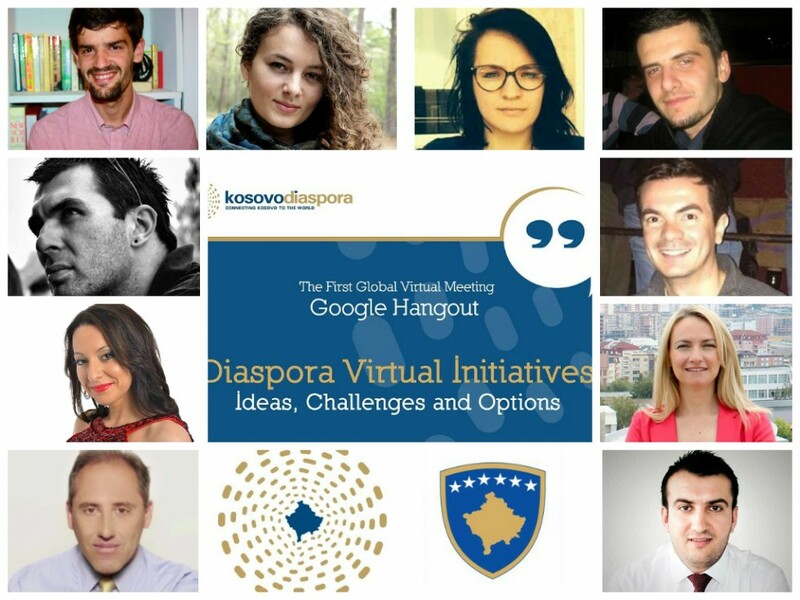 In honor of Global Entrepreneurship Week, Kosovo Diaspora organized the first video conferencing via Google Hangout connecting Kosovo’s government with the Albanian diaspora. Global Entrepreneurship Week is the largest celebration of the innovators and job creators. The forum brought together leading representatives from Kosovo and abroad who promoted a culture of entrepreneurship and encouraged economic development. The Google Hangout forum was the first all-virtual interview connecting people from all over the world, with live Q&A session. 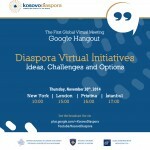 The topic was “Diaspora Virtual Initiatives: Ideas, Challenges, Possibilities”. The participants included: Lorik Pustina (Prishtina), Head of Public Affairs at the Kosovo Ministry of Diaspora; Ermira Babamusta, Ph.D. (London/New York), international relations expert; Flamur Mavraj(Oslo), creative designer/web developer; Alban Nevzati (Zurich), Managing Partner of ODA Lab; Kosovare Krasniqi, Project Manager at Balkanspring; Mark Kosmo Ph.D., Director of the MAASBEA (Massachusets Albanian American Society) and Behar Xharra (Dhaka), founder of Kosovodiaspora.org. Click here to watch the discussion. 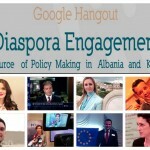 The Google Hangout forum was organized by Liza Gashi, Qëndresa Krasniqi, Albion Curri and Behar Xharra. “This virtual forum was put together in an effort to shed light to the ideas and opportunities to connect with our Diaspora and identify ways in which they could be promoted. The message sent through this hangout by Kosovo Diaspora is that such meetings are an effective way of creating a communication culture between Kosovar businesses, Kosovo Government and the Diaspora,” stated Qëndresa Krasniqi, manager of the Kosovodiaspora.org platform. Lorik Pustina presented the initiative of the Ministry of Diaspora “The Diaspora Registry” which seeks to collect demographic data pertaining to the number of people of Kosovar origin, the number of people who have emigrated from Kosovo and businesses owned by Kosovars. This project is intended to be completed by 2016 and it will continue to be active afterwards. Every individual, born or whose origin traces back to Kosovo can register through the official page http://rdks.info. Lorik Cana is one of the supporters of the Kosovo Registry Initiative. For this project, the Ministry of Diaspora has been cooperating closely with KosovoDiaspora.org and Economic Inclusion of Kosovar Diaspora in an attempt to gather large data. “The impact of our Diaspora will be tenfold once we realize their true numbers,” stated Lorik Pustina, Head of Public Affairs at the Ministry of Diaspora. Alban Nevzati introduced the first Albanian interactive application “Hirushja”, an App that seeks to help Diaspora young children learn Albanian. This is the first ever-interactive application with Albanian fairytales where children (age 3-8) can learn the alphabet. The application is a project of Oda Lab and Lepuroshi Learning Center and it will be available on iOS and Android on the 15th of February 2015. For more information visit www.Oda-Lab.com. “Hirushja” is yet another educational tool for the Albanian children, especially for the Diaspora children who seek to learn the language. Hirushja will be one of the fairytales that will be launched under the educational center “Lepuroshi”, a collection of interactive activities for children. This is a fun way for them to learn, read stories and play,” said Alban Nevzati, Managing Partner at Oda Lab, Zurich, Switzerland. Kosovare Krasniqi discussed female entrepreneurship, the ICK Business Development Center in Kosovo and its cooperation with the Norwegian Ministry of Foreign Affairs in the project initiative “Balkanspring” (Balkanspring.com). This initiative enables domestic products from Kosovo to reach global markets. Until now, this initiative has reached 50 domestic producers including minorities and an estimate of 2000 domestic products from Kosovo.”Beside the existing businesses, Balkanspring has managed to register an additional 19 new businesses that will contribute for Kosovo’s economy,” said Krenare Krasniqi, Project Manager at Balkan Spring in Norway. Mark Kosmo of the Massachusetts Albanian American Society (www.maasbesa.org) talked about a proposal for promoting professional exchange between members of the Diaspora and their professional counterparts in Albania and Kosova. He is also in contact with Harvard University about their Albania Project which seeks to promote the role of the Albanian Diaspora in Albania’s economic development. The Harvard project is supported by the Open Society Foundation of Albania (Soros). For more information visit http://projects.iq.harvard.edu/albaniagrowthlab/overview. Ermira Babamusta spoke about the contribution given towards strengthening diplomatic ties between the United States, Albania, Kosovo and UK, by emphasizing a great historical friendship and cooperation with the Albanian Diaspora. Also, Babamusta mentioned her initiative, the petition to protect human rights of Albanians, and her collaboration with Albanian Roots, Kosovo Consulate in New York, VATRA, important meetings with US officials to lobby for Kosovo’s independence, and other success stories of community engagement. “The Diaspora is always ready to engage in issues concerning the well-being of Albanians. I am very thankful to the US and UK for being such strong supporters and the voice of the Albanians in the international arena. I value the great friendships we have between our countries,” stated Ermira Babamusta, co-founder of Democracy and Unity Foundation (www.DemocracyandUnity.org). Flamur Mavraj concluded with suggestions on the aforementioned projects, from the technical and developing point of view. Mavraj proposed a closer collaboration between Open Data Kosovo and Kosovo Statistics Agency in utilizing statistical data. He also discussed the idea of outsourcing, a business strategy through which many companies could overcome difficulties and lack of staff in Kosovo. This event highlighted the importance of leadership programs, innovative ideas, female entrepreneurship, small business, job-creation and other causes that shape the entrepreneurship spirit to build a better future for Kosovo.